This image appears in several resources but I have been unable to find the exact rules for the axial system that produced it. In the book, this figure is presented in the context of L-systems and is referenced in the text as follows. 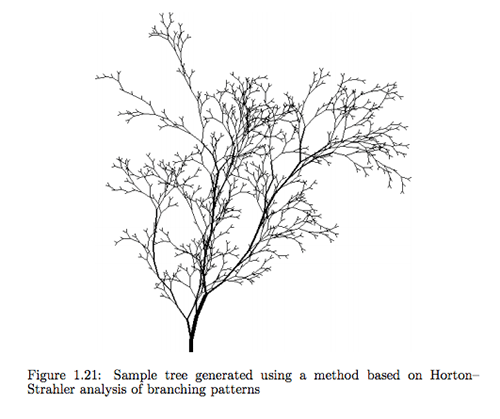 Of special interest are methods proposed by Horton [70, 71] and Strahler, which served as a basis for synthesizing botanical trees [37, 152] (Figure 1.21). I am unable to find a copy of the PhD thesis (ref 37) and ref 152 does not produce this figure. Performing a Google image search with this image points to material related to the book, such as slides. Has anyone here reproduced this figure?